Sometime before 373 A.D., the Clans of the Gaelic Nations came from the west coast of Spain and established themselves on the east coast of Ireland. From there they moved on to the west coast of Scotland, and the Scots called them "Erinviene's". Erin - meaning from the west, Viene - meaning a brave, resolute, worthy man. During this time the Erinviene's had close relations with the Kings of Scotland. 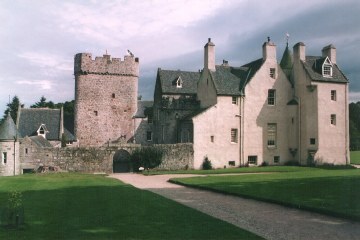 During the time the Erinviene's stayed on the west coast of Scotland they built Irving castle, which later became the Town of Irving, and named the Irving River after their clan. Today, both the town and the river are called Irvine. In 373 A.D. the Erinviene's, together with other Scottish clans, fought against the Romans. King Eugenius died, and the Erinviene's and the rest of the Albion Scots fled to Scandinavia. For many years the Scots tried to retake their land. In 404 A.D., Fergus was made King. Fergus II led the return to Scotland and, along with the Erinviene's and other Clans, they drove the Romans out of Scotland. Three Erivine brothers - Erinus, Grim and Duncan - were grandsons of Duncan, the first of the Eryvine's, who was killed at Duncrub in 965 A.D. The eldest brother, Erinus, who ranked second to the king, inherited his family's titles as Seneschal of King's Rents, Athbane of Dule and Abbot of Dunkeld. He married the eldest daughter of King Malcolm II. Duncan was the ancestor of the entire Irving Clan. Sometime before 1034, Duncan was named Prince of Cumberland by his Grandfather, Malcolm II, King of Scotland. Prince Duncan took several of the old Clans to the south border to defend Scotland from England, and Prince Duncan's uncle brought his clan, the Erivine's, with him. They built the Towers of Bonshaw along the banks of the Kirtle and many manor houses in what became the ancient home of the Irving Clan. Malcolm II had no male heir when he was assassinated in 1034. The throne was occupied by the grandson of Malcolm and son of Erinus, Duncan Erivine I. During his reign, Duncan was defeated in his campaign against the Norsemen and led the remnants of his army home in 1040. While returning, he was attacked and killed by his first cousin, MacBeth the Usurper; who assumed the throne and ruled for 17 years. It is around Duncan's murder that Shakespeare's play MacBeth is based. Erinus was killed by MacBeth's forces in 1045 while seeking revenge for the murder of his son. The sons of Duncan I remained in hiding until 1057 when Malcolm Erivine raised an army to challenge MacBeth. With the help of Lord MacDuff, Thane of Fife, he defeated and executed the Usurper. Malcolm defeated MacBeth's stepson, Lulach, and he regained his father's throne and became Malcolm III. This succession included David I 'The Saint' who created all the offices of the royal court and William 'The Lion of Justice' who created the lion rampant as his battle crest and coat of arms. The line ended with Alexander III when he rode his horse over a cliff on a dark December night in 1286. Alexander III was predeceased by his heirs and with his death the succession was cast into dispute. Thirteen claimants stepped forward to declare their right to the throne, all having some relation to the line of Irving. John Balliol, the primary claimant, was great-great-great grandson of David I, while his only serious rival was Robert the Bruce, the great great-great-great grandson of David I. Edward 'Longshanks' of England chose Balliol to be King of Scotland, who had to promise subservience to London. When Balliol could no longer tolerate following the direction of the English he was deposed and imprisoned in London. Now only Balliol's nephew, John 'Red' Comyn, stood between Robert the Bruce and the throne. These two agreed to meet at the Church of the Grey Friers in 1306 to resolve their dispute. That discussion ended when, in the heat of argument, Robert put a dagger through Comyn's heart. During his famous campaign against the English, Robert the Bruce often sought help and refuge from his kinsmen, the Irvings of Bonshaw. He chose William de Irwyn as one of his principle aides and companions. As the story goes, at one point King Robert found himself put to flight by his enemies with only a few of his aides around him. Exhausted by the chase, the King was compelled to sleep under a holly tree while William stood guard over him. Holly leaves are now a prominent feature in all seven family crests which represent the major branches of the Irvine clan. William stood by King Robert again at famous battle of Bannockburn in June of 1314 (one of the few battles where the Scots defeated the English) and for his service was awarded the Royal Forest of Oaks in Aberdeenshire and Drum Castle which guards it in 1323. 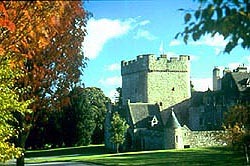 From that point on, Drum Castle was continually occupied by the Irvines for over 650 years. This land had previously belonged to John'Red' Comyn. Drum was made into a free barony in 1329. Sir William de Irwyn married a granddaughter of Robert the Bruce, who was the daughter of Robert Douglas, Earl of Buchan. From this union was derived the two great families of Bonshaw and Drum. For seventeen generations, starting with the second Laird of Drum, there was a successive line of Irvines all bearing the name Alexander. Sir Alexander Irvine, Third Laird of Drum, who was the grandson of William de Irwyn, was one of the chief commanders of the King's army at the battle of Harlaw, circa 1411 A.D. He was a valiant champion. Alexander lead the forces of Aberdeenshire with his cousin, the Earl of Mar, to meet the invaders from the Hebrides. Before the battle, Alexander made his brother swear that should Alexander be killed, Robert would assume his baronial right at Drum. During the battle Alexander encountered the ferocious Chief of the MacLeans of Duart in Mull, known as Red Hector of the Battles. After 'noble and notable single combat' the two of them lay dead upon the field, killed by mortal blows struck upon each other. Many Irvines died in the battle of of Harlaw. Younger brother Robert carried out his oath and changed his name to Alexander and married his elder brother's fiancée, Elizabeth de Keith. Sometime later he led the delegation which negotiated the release of James I from the hands of the English, for which he was knighted. James V rewarded the sixth Laird of Drum in 1547 for his peace making efforts. Many Irvines also died at the battle of Flodden on Sept. 9, 1513. 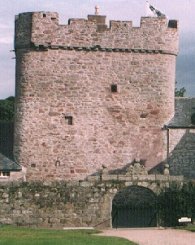 Drum Castle was plundered three times during the Covenanting Rebellion throughout which the royalist Irvine's supported Charles I. Sir Alexander, a Royalist, was forced to conform to the Covenant and was appointed Sheriff of Aberdeen in 1634. Alexander, 10th Laird of Drum, his brother Robert Federett and his two sons were imprisoned at the Tolbooth in Edinburgh several times. His son Robert died there in 1646. When Charles became King in 1660, he offered Sir Alexander's son Alexander, tenth Laird of Drum, an earldom as reward for his support, which was refused. The 14th Laird took part in the Jacobite rising of 1715 and Alexander, the 17th Laird joined Prince Charles at Culloden in 1745. He escaped imprisonment and forfeiture despite being charged twice with treason. 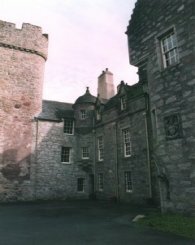 The offer of royal peerage was made to the eleventh Laird, but was turned down because the king wouldn't pay to repair damage sustained to Drum Castle while the family had supported the king. After the fourteenth Laird (a Jacobite) was killed at the Battle of Sheriffmuir in 1715, the estate passed to John Irvine of Crimond. After this, the Irvines continued to fight for the Jacobite cause, and because of this, the Laird spent 7 years in exile in France after the defeat of Prince Charles at Culloden. The present name of Irvine is believed to have originated in Galloway with the fleeing of Gilchrist filius Eruini between 1124 and 1165. In fact, the earliest traditional Irving of Dumfriesshire was the alleged father of William of Drum who fled circa 1306 A.D., and the earliest extant contemporary record of Irvings in Dumfriesshire was not until 1367. Irvin, Irvine, Irwin and Erwin are identical names belonging to the same family. The wide range of variations is attributed to medieval census takers who relied on spoken pronunciations of the name. In the past 1500 years the original family Erinviene name has been altered into many different versions: Curwing, De Irwin, D'Irevigne, D'Orvin, Eirryn, Erevine, Erewynis, Erin, Ervin, Ervine, Erving, Ervinge, Erwin, Erwine, Erwing, Erwyn, Eryvine, Eryvinus, Eurwing, Hierewine, Hirevigne, Hirevigne, Hurven, Irevigne, Irewin, Irewing, Irewyn, Irrewing, Irrewings, Irruein, Irruen, Irruwing, Irrwin, Irrwing, Irrwingis, Iruin, Iruine, Iruing, Iruwyn, Irveyn, Irvin, Irvine, Irving, Irvinge, Irvinn, Irvinus, Irvyn, Irvyerins, Irwan, Irwaynes, Irwein, Irweing, Irwen, Irwenis, Irwin, Irwine, Irwing, Irwinge, Irwyn, Irwyne, Irwynn, Irwynnis, Irynagio, Orruein, Ourine, Ouron, Urin, Urwen, Urwens, Urwin, Urwine, Vrwin, Yrwens, Yrwin, Yrwins. ** This article was written by Eric Irvine, © 2001. The article was copied with permission from "A Brief History of the Irvines" and reproduced in it's entirety; only changing font and style to fit this site.